A delightfully absurd story about a ménage-à-trois and working life! This imaginative tale begins when Hans meets a little man in a funny hat living in his garage, who tells him that his name is Garage Honcho – and refuses to be called a gnome. There follows a series of events in which the relationships among Hans, his wife Birgitta, and his friend Ilpo are turned topsy-turvy, an elephant moves out of their living room and gets a job in a china shop, a group of egg-laying garden gnomes start a liberation movement, and Kusti, a snail mailman, is laid off when Snail Mail is sold to France. 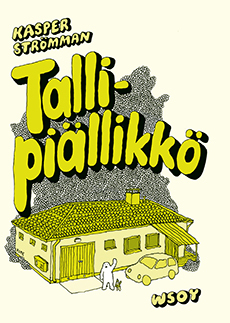 Garage Honcho is Kasper Strömman’s first full-length comic strip album, and as we all know, the first is usually the best.